This symposium follows earlier editions that took place in Bordeaux in 2010, 2012, 2015, 2016 and in Paris in 2013. 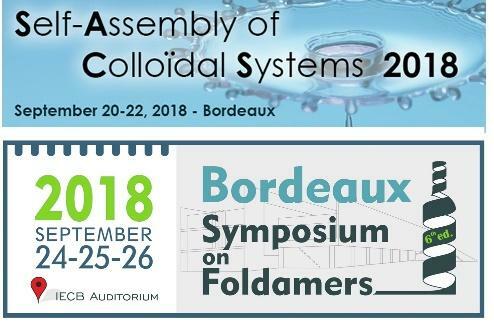 The purpose of this sixth edition will be to show that foldamers - artificial folded molecular architectures with functions - represent a multidisciplinary subject, ranging from synthetic oligomers to folded polymers and to protein and nucleic acid design. A prime objective will be to illustrate the multidisciplinary aspects of the field. The opening of the symposium is scheduled on Monday September 24, 2018 afternoon. Closing will be on September 26, 2018. Attendance will be limited to ca 120 participants. 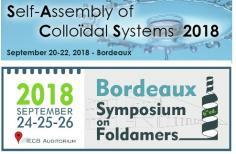 The International Conference on Self-Assembly of Colloidal Systems (SACS’18) aims to bring together some of the most active and recognized chemists, physicists, theoreticians and engineers, to discuss the use of self-assembly as a tool to design functional colloidal materials with tailored properties. Applications of bottom-up colloidal and polymer materials (e.g., energy, responsive materials, metamaterials, MEMS, catalysis, nano-medecine, etc.). This event is associated with the “Soft Matter for Functional Materials – SoFun’2” summer school, which will take place from 17th to 19th September near Bordeaux and will be dedicated to the elaboration techniques, the characterizing methods and the theoretical aspects of functional soft materials.